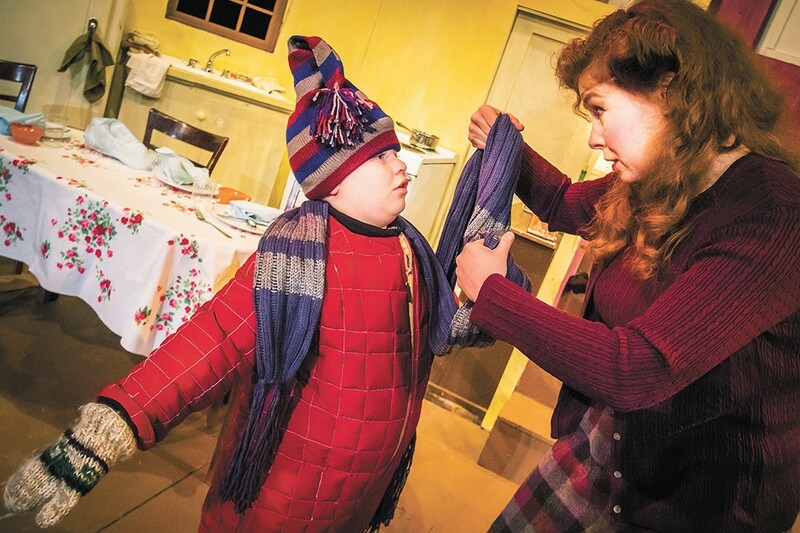 Kevon Burget (left) as Ralphie and Tom Armitage as Jean Shepherd in A Christmas Story. It was a 1966 book by radio personality Jean Shepherd that found wider fame two decades later as a movie on broadcast TV. 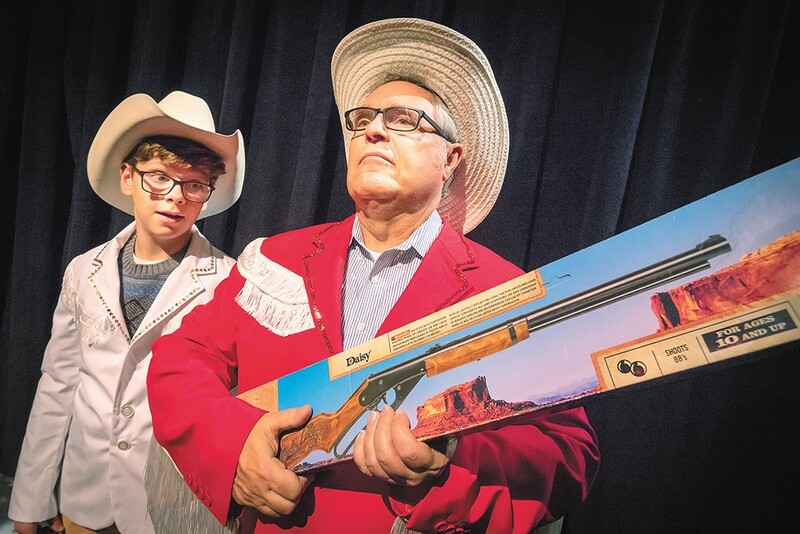 In it, a young boy named Ralphie has his sights set on a BB gun — not just any BB gun, mind you, but a Red Ryder Carbine Action 200-shot Range Model air rifle with a compass in the stock and "this thing which tells time." And so he dreams up a series of naive but imaginative ploys to ensure it appears under the tree on Christmas morning. Along the way, he has to wrestle with neighborhood bullies, a skeptical mother, an annoying kid brother and a mercurial father. Though set in the first half of the 20th century, the motifs and characters of A Christmas Story still resonate with audiences of all generations. For many of us, it's become a sacred and immovable part of our seasonal ritual. That's equally true for Tom Armitage. "I watch it every year during the holidays," he says. "It's stuck indelibly in my mind." But after close to 40 years as a local high-school drama teacher, Armitage has spent his recent retirement avoiding the movie. Not because he's gone off it, but because he's trying to escape its influence as he rehearses for A Christmas Story: The Musical, which opens tonight for a one-month run at the Spokane Civic Theatre. He'd rather take the 2012 stage adaptation on its own merits. "Like you do any role, it comes out of the text. That's the No. 1 thing." Armitage plays the show's narrator — no small task, given that so much rests on the role. He has to be worldly enough to appreciate the wonder and innocence of youth, knowing but not sarcastic, eloquent with an everyman aura, part of the cast while also existing outside of it. "At first, I sound like a slick radio announcer and I'm literally in a radio studio. But soon I'm up on my feet and I'm actually on the set with the family. They can't see me, but I'm right there among them. So I'm a radio announcer, but then I'm also this storyteller who has a direct relationship to the audience," he explains. Brody Else as Randy and Tami Knoell as Mother in A Christmas Story. "And then it goes to another level where I feel like I really am still Ralphie, and there are certain times when I take his lines." He cites the now-famous scene in which Ralphie's friend Flick gets his tongue stuck to a freezing flagpole, and Ralphie — or, in this case, his adult self — denies any involvement. "There are some real interesting choices that have to be made about how to play it. Am I acting like a kid? Am I making fun of myself?" That's where Kathie Doyle-Lipe's direction has helped not just Armitage but the entire cast of A Christmas Story: The Musical, many of whom are grade-schoolers. "She's being true to what it's all about. I remember one of the early rehearsals was just [the characters of] Mother, Old Man, Ralphie, Randy and me, and we sat there and told Christmas stories about our own families. Because that's the key to it. Everybody has a different childhood Christmas memory, but we're telling a story that everybody in some way, shape or form identifies with." As a devotee of the film for those very reasons, Armitage understands why some audiences might be wary of a stage adaptation. "The nostalgia part of it is so important," he says. Our parents' all-too-human idiosyncrasies, the comedy of errors in a schoolyard dare, the single-minded anticipation of an upcoming holiday, the misplaced confidence that a fourth-grade essay is "a great work of rhetorical genius," as the show's narrator describes it — all of these are near-universal events of childhood that, with the benefit of a little time and distance, become the defining moments that we recall — sometimes fondly, sometimes wryly — as adults. Even if we didn't experience those events exactly, there's almost something about them that we would like to have experienced.